Need to drill a cabinet into a super thick wall? Or perhaps fit your new hardwood floors? Or maybe you have the hard job of fastening something onto concrete? With a power drill all of these tasks are easily achievable. Power drills are built to tackle more heavy-duty work than your average household tool. Their powerful rotating motion significantly increases the force of the drill and gives the tool a lot of oomph. Although a power drill looks rather simple, considering the unlimited number of different models out there, the choice can be overwhelming. To make it easier for you, here are the 3 most important steps which should guide your decision. One of the first decisions you’ll be confronted with is whether you should pick a corded or a cordless model. Cordless models are extremely convenient because they can be taken just about everywhere without having to worry whether there’s any electrical outlet nearby. This makes them the best tools for outdoor drilling jobs. On the other hand, corded drills are usually more powerful than their cordless counterparts, significantly reducing the time and effort. When you have a lot of holes to drill or working with thicker materials, a corded drill can make a huge difference. But then there’s the cord which can get in your way and limits the use to jobs near a power outlet. How much power a drill can generate dictates the kind of jobs it can be used for. Cordless drill models range from between 7 volt to 24 volts. 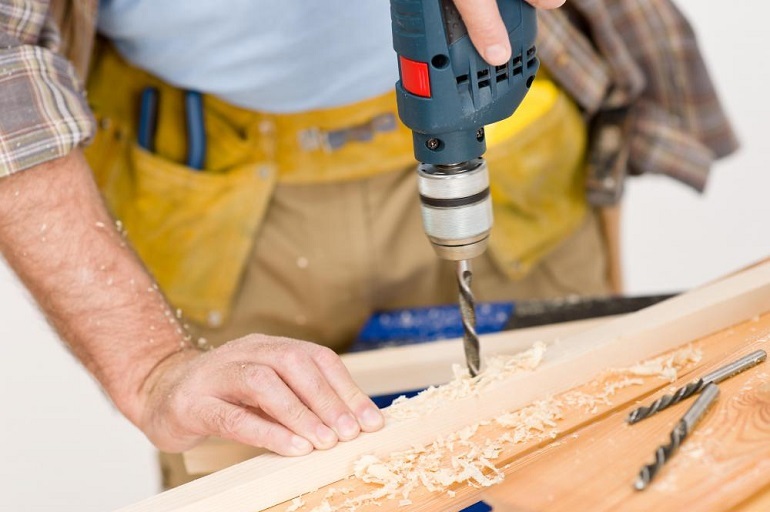 A 7 volt unit should be suitable for some light drilling, similar to a cordless screwdriver, while 24 V can tackle the tougher tasks in a home improvement project. On the other hand, corded units are much powerful and that’s why their performance is measured in watts. Their wattage ranges from 500 W for very small models up to 2000 W for larger ones. Keep in mind that the more power it generates, the larger and heavier the tool will be. That’s why high-powered units are used only for tough construction site projects. For most home users, cheap power drills ranging around 10 volts for cordless and 1000 watts for corded seem to be just right. Drills usually come in three sizes: 1/4- inch, 3/8- inch and 1/2 – inch sizes. These measurements all refer to the size of the drill chuck – the part that determines the maximum-diameter bit shank that can fit the drill. For a light-duty drill, a 1/4- inch chuck is suitable for most home jobs. A 3/8-inch chuck is also good for work around the home and can work with a wider range of bits. For more heavy-duty application, a 1/2-inch chuck is recommended. Today, some models have keyless chucks which allow you to loosen the chuck by hand in order to change the bit, however there are still many cheap power drills that have keyed chucks which you should be extra careful not to lose.